In the spring of 1947, Gracie turns her eye towards things that are fresh and new: a new hat, a new hemline, and a new home. The real estate wrangling of Beverly Hills most brilliantly befuddled wife finds the Burnses bunking with various members of the cast, occupying a janitor's apartment, and even living separately at the YMCA/YWCA. All's well that ends well�but, until then it's hilarious! First-rate supporting players fan the flames of the mirthful misfortune, including Bill Goodwin, Elvia Allman, Hans Conried, Mel Blanc, Elliott Lewis, Verna Felton, Bea Benaderet and more. 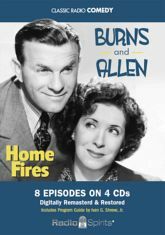 Includes 8 digitally remastered and restored episodes of Maxwell House Coffee Time and a Program Guide by Ivan G. Shreve, Jr.